Congratulations to the Kerry minor hurling team on winning the Todd Nolan Cup at last weekend’s inter county hurling tournament that also included Under 16 Development squads from Limerick, Cork & Tipperary. The semi-final results were Kerry 0 - 17 Limerick 0 - 10; Tipperary 1 - 12 Cork 1 - 10. In the Cup Final, Kerry had a hard earned 1 - 14 to 1 - 10 win over Tipperary. The Kerry captain was Mikey Clifford while Dylan Moriarty won the Player of the Final Award. The Shield final result was Cork 1 - 21 Limerick 2 - 11 and the captain was Jamie Fogarty (Killeagh) with Isaac Walsh (Lisgoold) getting the Player of the Final Award. The successful Kerry panel was: Darragh Quinlan [Ballyduff], J.P. O'Carroll [Ballyduff], Darragh Slattery [Ballyduff], Billy Daly [St. Brendan’s], Daire Nolan [Kilmoyley], Aodhán Shanahan [Lixnaw], Ronan Walsh [Kilmoyley], Nathan Guerin [Ballyheigue], Mikey Kelliher [Lixnaw], Pádraig O'Sullivan [St. Brendan’s], Dylan Moriarty [Ballyduff], David Mahony [Ballyheigue], Liam Palmer [Kenmare], Aodhán Behan [Crotta], Seán Brosnan [St. Brendan’s], Kian Regan [Kilmoyley], Graham Slattery [Ballyheigue], Conor O'Sullivan [Ballyheigue], Tadhg McKenna [Crotta], Mikey Clifford [Abbeydorney], Eoin O'Shea [Kilgarvan], Evan McCarthy [Lixnaw], Ronan Foley [Kilgarvan], Tadgh Reen [Tralee Parnell’s], Niall Fitzmaurice [Tralee Parnell’s], Brendan Walsh [Ballyheigue], Denis Nolan [Crotta], Cian McCarthy [St. Brendan’s], Aidan O’Connor [Ballyduff], Gary Randles [Kilgarvan]. Bainisteoir: John Hennessy; Roghnóirí: John Healy, Ollie Broughton, Jerome O’Sullivan, Anthony Fealy. Thanks to all who made the Tournament so successful including the Nolan family, the Crotta and Abbeydorney clubs, Giles O’Grady, Paudie Dineen, Gerard McCarthy, the visiting county teams and all the volunteers on the day. Causeway 2 - 14 Kilmoyley 0 - 16; Abbeydorney 0 - 8 St. Brendan's 2 - 19; Crotta 2 - 18 Ballyduff 2 - 17. Co. Under 16 Hurling League Division 2 results: Lixnaw 4 - 8 Kilmoyley 5 - 8; Crotta 1 - 15 Abbeydorney 2 - 11; Tralee Parnell’s 4 - 10 South Kerry 1 - 2. Fixtures for this Sunday, 31 March - South Kerry v Crotta; Abbeydorney v Kilmoyley; Lixnaw v Tralee Parnell’s. The U16 Co hurling league game Kenmare/Kilgarvan v Ballyduff has been re-fixed for Sunday April 7th 12.00am. Under 16 Division 1 has just 4 teams competing and will commence on this Sunday, when Kenmare/Kilgarvan host St. Brendan’s and Ballyheigue are at home to Ballyduff. All games in both Divisions at 12 noon, first named team at home. Timmy Weir (Abbeydorney) is the co-ordinator for this competition. The Lee Strand Under 12 hurling leagues across 3 Divisions will commence on this Friday evening, 29 March with 9 games down for decision. All Round 1 games at 5.30p.m. Division 1 fixtures - Crotta v Tralee Parnell’s; Kenmare/Kilgarvan v Rathmore; Ballyduff v Ballyheigue. Division 2 – Lixnaw v Kilmoyley; Abbeydorney v St. Brendan’s; St. Pat’s/Dr. Crokes v Kenmare/Kilgarvan B; Firies bye. Division 3 – Crotta B V Tralee Parnell’s B; Kenmare/Kilgarvan c v Causeway; Ballyduff B v Ballyheigue B. Patrick Corridon (Ballyheigue) is the co-ordinator for this competition. The Lee Strand Under 14 hurling leagues will commence on Saturday week, 6 April, 5.00p.m. with the following fixtures: Division 1 - St. Brendan’s v Lixnaw; Kenmare/Kilgarvan v Tralee Parnell’s, Ballyduff v Crotta. Division 2 – South Kerry v Ballyheigue; Kilmoyley v Firies; Causeway v Abbeydorney. Liam Goggin (Causeway) will be the Under 14 hurling co-ordinator. 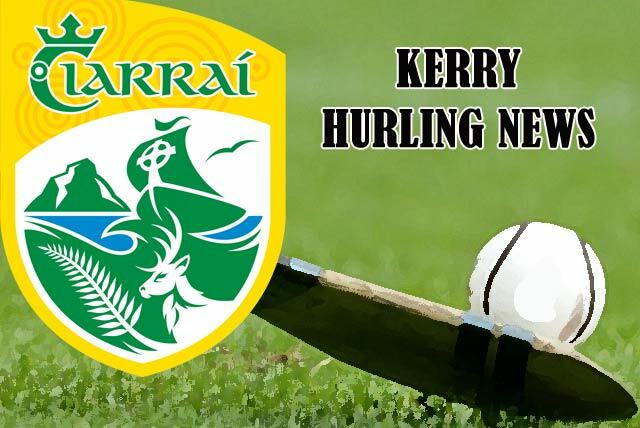 The North Kerry Intermediate Hurling League will commence on Friday week, 5 April with games at 6.45 p.m. Round 1 fixtures are: Group 1 - Kilmoyley v St. Brendan's; Lixnaw v Tralee Parnell’s, Causeway v bye. Group 2 - Crotta v Ballyheigue; Abbeydorney v Lady's Walk. Dates for the North Kerry Minor Hurling League are Sundays 14, 21 & 28 April with the Finals on Sunday, 5 May. All games at 11.00a.m. Round 1 fixtures are: Group 1 - Abbeydorney v St. Brendan's; Causeway/Kilmoyley v Crotta O'Neill's; Group 2 - Lixnaw v Ballyheigue; Tralee Parnell's v Ballyduff.